The term “differential scanning calorimetry” describes an instrument that measures energy directly and allows precise measurements of heat capacity. This technique is widely used to measure the difference in the amount of heat required to raise the temperature of a sample and standard reference. The resultant heat difference is a function of temperature. It is generally abbreviated as DSC. During this procedure, both the sample and reference are maintained at uniform temperature. The reference sample should have a well-defined heat capacity over the range of temperatures to be scanned. In general, the entire process of DSC is designed in such a way that the temperature of the sample material increases proportionally with time. 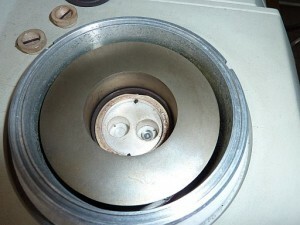 The equipment used for this technique is called differential scanning calorimeter. A simple calorimeter in general measures both endothermic and exothermic heat. Differential calorimeter measures the heat of a sample relative to a reference whereas DSC conducts all the above and heats the sample with a linear temperature increase. The working of this equipment is based on the detection of phase transitions. The differential temperature (∆T) between the sample and reference is converted to differential heat flow in a similar fashion as current flows through a conductor as seen in Ohms Law. Heat Flow= ∆T/R k1k2 where: ∆T= temperature difference (potential), R=thermal resistance of constantan disk of DSC that acts as a medium of heat transfer to the sample and the reference, k1= factory-set calibration value and k2= user-set calibration value. Differential thermal analysis (DTA) is an alternative technique that is quite identical to DSC. In this method, the heat flow to the sample and reference remains the same rather than the temperature. Phase changes and thermal processes cause a temperature difference between the sample and reference when heated under same temperature. DSC and DTA provide identical information. Silver furnace: It maintains temperature uniformity. Sample purge: It is utilized for excellent oxidative stability measurements. Purge Preheated: This maintains very low noise from turbulence. Air cool: This component is required for fast return to room temperature. When the sample undergoes a physical transformation such as a phase or state transition, certain amount of heat may flow towards it instead of the reference to maintain uniform temperature. This is entirely dependent on whether the process is endothermic or exothermic. If a solid melts to liquid it requires more heat to increase its temperature at the same rate as the reference. This condition occurs due to absorption of heat by the sample as it goes through a phase transition from solid to liquid through an endothermic process. In an exothermic process, less heat is required to elevate the temperature of the sample. 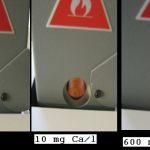 Differential scanning calorimeters are able to measure the amount of heat absorbed or emitted by observing the difference in heat flow between the sample and reference during any transition. Mild phase changes such as glass-liquid transition can be easily observed using this equipment. Hence, it is extensively used in industrial settings as a quality control instrument, owing to its ability to evaluate purity of the sample and polymer curing. Heat flow through the chromel wafer creates a temperature difference ∆T, which is measured as the voltage difference ∆U between the sample and reference constantan/chromel junctions. The voltage is adjusted for thermocouple response S. It is proportional to heat flow. The formula to measure the temperature difference is given below. DSC is primarily used to measure a number of properties of the sample. Fusion, crystallization, glass transition and oxidation are some of the chemical reactions that can be studied using this technique. It is widely used for a wide range of applications, including routine quality test and research tool. Using low melting indium 156.5985 °C makes the calibration easy. DSC examines the composition of polymers. It can show polymer degradation by reducing the melting point, Tm that depends on the molecular weight of the chemical. The percentage of crystallinity of a polymer can be detected from the crystallization peak of the DSC graph as the heat fusion is calculated from the area under an absorption peak. It is also used to study thermal degradation of polymers. Any form of impurities can be determined by examining the thermograms for anamolous peaks. It is used in the study of liquid crystals as some of them while undergoing transition attain a third state that display properties of both solid and liquid phase. This liquid is normally called liquid crystalline or mesomorphous state. DSC helps in observing the small energy changes that occurs as phase transition from solid to a liquid crystal and from a liquid crystal to an isotropic liquid. DSC is used to study the stability of samples that undergo oxidation and always require an airtight sample chamber. These tests are done under isothermal conditions by changing the atmosphere of the sample. In the first step, the sample is heated to the required test temperature in the presence of nitrogen that creates an inert environment. Oxygen is later added to the setup. There is a deviation in the baseline when oxidation occurs. Such an analysis can be used to monitor the stability and optimum storage conditions for a material or compound. DSC is a reliable safety screening tool. In this setup, the sample is kept in a non-reactive gold or gold plated steel crucible that can withstand pressure up to 100 bars. In the presence of an exothermic reaction, the thermal stability of a substance can be easily assessed. It is commonly used in the pharmaceutical and polymer industries. It is also used for studying various exothermic curing processes, owing to the cross-linking of the polymer molecules. A positive peak in the DSC curve can be observed after the glass transition. Freezing-point depression is the phenomenon in which the freezing point of a liquid is depressed when another compound is added. This particular phenomenon can be used as a purity analysis tool by DSC. DSC is available at $6500.00 in the market. DSC was developed for the first time by E.S. Watson and M.J. O’Neill in 1962. It was introduced to the public at the Pittsburgh Conference on Analytical Chemistry and Applied Spectroscopy in 1963. However, the first differential scanning calorimeter was developed by P.L. Privalov and D.R. Monaselidze in 1964. Very detailed information. Thanks for your sharing.